The Porsche 911 GT1 is a car designed and developed by German automobile manufacturer Porsche AG to compete in the GT1 class of sports car racing, which also required a street legal version for homologation purposes. 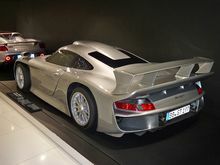 The limited-production street-legal version developed as a result was named the 911 GT1 Straßenversion (Street version). With the revival of international sportscar racing in the mid-1990s, though the BPR Global GT Series (which then morphed into the FIA GT Championship) Porsche expressed interest in returning to top level sports car racing and went about developing its competitor for the GT1 category. Cars in this category were previously heavily modified versions of road cars, such as the McLaren F1 and the Ferrari F40. However, when the 911 GT1 was uneveiled in 1996, Porsche exploited the rule book to the full and stunned the sports car fraternity. Rather than developing a race version of one of their road going models, what they created was effectively a purpose built sports-prototype but in order to comply with regulations a street legal version was developed called the 911 GT1 Straßenversion - literally a road-going racing car. In spite of its 911 moniker, the car actually had very little in common with the 911 of the time, only sharing the front and rear headlamps with the production sports car. However its frontal chassis was shared with the then (993) 911, while the rear of the chassis was derived from the 962 along with its water-cooled, twin-turbocharged and intercooled, 4 valves per cylinder 3,164 cc (3.2 L) flat-six engine fuel fed by Bosch Motronic 5.2 fuel injection, which was longitudinally-mounted in a rear mid-engine, rear-wheel-drive layout, compared to the rear-engine, rear-wheel-drive layout of a conventional 911. The engine was generated a power output of about 600 PS (441 kW; 592 hp). In comparison, the 993 generation 911 GT2, which was otherwise the company's highest-performance vehicle at the time, used an air-cooled engine with only two valves per cylinder. The 911 GT1 made its debut in the BPR Global GT Series (the FIA championship's predecessor) at the Brands Hatch 4 hours, where Hans-Joachim Stuck and Thierry Boutsen won comfortably, although they were racing as an invited entry and were thus ineligible for points. They followed up by winning at Spa and Ralf Kelleners and Emmanuel Collard triumphed for the factory team at Zhuhai. The 1996 911 GT1 clocked at a top speed of exactly 330 km/h (205 mph) on the legendary Mulsanne Straight in the practice sessions of the 1996 Le Mans 24 Hours Race. Towards the end of the 1996 season, Porsche made revisions to the 911 GT1 in preparation for the 1997 season. The front end of the car was revised including new bodywork which featured headlamps that previewed the all-new generation of the (996) Porsche 911 which would be unveiled in 1997. The revised car was known as the 911 GT1 Evo (or Evolution). As far as performance goes, the car had the same engine as the previous version, but new aerodynamic elements allowed the 1997 version to be considerably faster than the 1996 version - acceleration was better, although the top speed was still around 330 km/h (205 mph) on the La Sarthe Circuit (in the race, the GT1-Evo attained a top speed of 326 km/h). However, the works cars suffered from reliability problems and did not last the full race distance; a privately entered 1996 specification GT1 managed 5th overall and third in its class, but was beaten by the BMW-backed McLaren F1 GTRs (long tail version). For the 1998 season, Porsche developed an all-new car, the 911 GT1-98. Designed to match the also new Toyota GT-One and Mercedes-Benz CLK-GTR, the 911 GT1-98 featured bodywork which bore more of a resemblance to traditional sports-prototypes than the previous two models. A new sequential gearbox was installed to reduce shift time. As per the regulations, a street-legal version of the 911 GT1-98 was spawned but it is believed that only one variant was produced which was still sufficient to satisfy the new regulations. During the 1998 FIA International GT season the 911 GT1-98 struggled to match the pace of the Mercedes, which also was improved, with the main reason being down to the air-restrictor rules which were regarded as unfavourable to the turbocharged engine (the Mercedes had a naturally aspirated V8 engine). The Michelin tyres of the factory team and especially the Pirelli of the private Zakspeed team were also considered inferior to the Bridgestone tyres of the Mercedes. At the 1998 Le Mans however, it was a different story. The BMW V12 LM retired with wheel bearing trouble, and the Mercedes CLK-LM cars had oil pump troubles in the new V8 engines that replaced the former V12. The Toyota GT-One, which was considered to be the fastest car, also suffered gearbox reliability problems. The 911 GT1-98, despite being slower than the Toyota or the Mercedes, fulfilled Porsche's slim hopes, taking both first and second place overall thanks to reliability, giving Porsche its record-breaking 16th overall win at Le Mans, more than any other manufacturer in history. At the Petit Le Mans race in Road Atlanta, the 911 GT1-98 of Yannick Dalmas made a spectacular backward flip and landed rear first before hitting the side barriers, as did the BMW V12 LMR at the same race in 2000, and most infamously the Mercedes-Benz CLR at Le Mans in 1999. The GT1 '98 was set up with higher downforce in the race than the previous two years, which reduced its maximum speed to 310 km/h (193 mph). However, in the 1998 Le Mans 24 Hours test days, the car hit 330 km/h (205 mph) on the Mulsanne Straight on a lower downforce setup. With Mercedes dominating FIA GT1 in 1998, all other entries including Porsche withdrew for the 1999 season. The GT1 class was cancelled, and the FIA GT Championship was contested with GT2 cars. Porsche could have entered at Le Mans, but chose not to try to defend the win of 1998 against the new entrants from other manufacturers. Champion Racing brought a 911 GT1 Evo to America to race in the American Le Mans Series, but was only allowed to do so as an LMP (Le Mans Prototypes) class entry, where it proved uncompetitive against actual prototypes such as the BMW V12 LMR. Following Champion's purchase of a 911 GT1 Evo for 1999, Gunnar Racing offered a custom race car to the team with intentions to race in 2000. The car, known as the Gunnar G-99, was a custom-built 911 GT1 with an open cockpit. The chassis was made from scratch yet remained nearly identical to the 911 GT1 mechanically, even using the bulk of the bodyparts. A large rollbar was put over the open cockpit to help protect the driver. A 3.6 litre flat-6 from a Porsche 911 GT3 was used in place of the standard 911 GT1 unit. However, Champion would instead turn to buying a Lola B2K/10, so the Gunnar G-99 was temporarily abandoned. The car would resurface in the Rolex Sports Car Series in 2002, yet would not be allowed to race until it had a roof again. Therefore, Gunnar Racing rebuilt the car with a near identical GT1 roof, and briefly competed in 2003. The car would take a best finish of second in class twice before being retired due to lack of funding and due to the ban on SRP cars in favour of Daytona Prototypes. Regulations for the GT1 category stipulated that to be eligible, a total of 25 cars must be built for road use. Porsche developed two fully road-legal versions, dubbed "911 GT1 Straßenversion", and delivered one in early 1996 to the German government for compliance testing, which it passed. The second vehicle is in the hands of Bahrain-based private car collector Khalid Abdul Rahim. These two cars feature 993 style front headlights. A further 20 units were built in 1997 with 996 style front headlights. A single car was built in 1998 to homologate the all-new racing version under the new FIA regulations. The engine had to be slightly de-tuned to meet European emissions laws, although its 400 kW (544 PS; 536 hp) at 7,200 rpm and 600 N⋅m (443 lb⋅ft) of torque at 4,250 rpm proved to be more than adequate; the car could accelerate to 100 km/h (62 mph) from a standstill in 3.9 seconds on its way to a top speed of 308 km/h (191 mph). ^ "Tony Hattter on designing the Porsche 911 GT1". 2017-10-26. Retrieved 2019-01-18. ^ "Porsche 911 GT1'98 Specifications". Retrieved 2011-10-22. ^ "Porsche 911 GT1 Racing Record". Retrieved 2011-10-22. Wikimedia Commons has media related to Porsche 911 GT1.